At the end of the last century, America grew up militarily. This was done in part through the use of sea power and by building the Great White Fleet. One of the fleet’s ships was the USS Newark. During the Civil War, ironclad warships were important to both the Union and the Confederacy. The Union depended on the Monitor and the Confederacy on the Merrimack. The Confederacy produced several other ironclads that fought successfully in other engagements. But following the 1860s, the nation’s naval superiority soon disappeared. Concerns about Western expansion, crossing the continent, and postwar withdrawal from things military as well as general economic considerations resulted in America’s naval decline. It was thought that patching up the old wooden fleet would be sufficient to maintain naval control. At the same time, Great Britain pumped more than $50 million into its fleet, creating the world’s most powerful navy. An American naval inquiry in the 1870s showed corruption, inefficiency and political interference, a situation that produced a second- or even third-rate Navy. In the 1880s, a new Navy came into existence. Even so, the last of the old wooden cruisers was not retired until 1897. At that time, Navy Secretary William Hunt appointed a commission to make recommendations for a modern naval force. In 1882, Congress turned its attention to new steel vessels with the construction of the Atlanta, the Boston and the Chicago, which later became the nucleus of the White Squadron of the Great White Fleet. Under the new plan, domestic armor plate was used. Naval architects were sent to England to study that country’s ship-building methods, and a naval gun factory was established at the Washington Navy Yard. By 1890, the battleship had become the centerpiece of naval defense, a status that remained in place for the next half-century. Naval historian Capt. Alfred Thayer Mahan and his book, 'The Influence of Sea Power Upon History, 1660-1793,' played an important role in naval planning and warfare for the future. An important part of the American war fleet was the USS Newark, the construction of which was authorized by Congress on March 3, 1885, under the Bureau of Construction and Repair of the Navy Department Act. The $1.2 million contract for the general construction was awarded to William Cramp Sons Ship and Engine Building Co. of Camden, N.J. Like other ships of the Great White Fleet, it was radically different from the Navy’s older wooden vessels. The Newark was 327 feet 7 inches long and 49 feet 2 inches wide, designed for a complement of 18 officers and 359 men. It was considered unique at the time because its armor was vastly different from the iron plates that sheathed the previous Ironclasses. The steel deck was 2 inches thick on the flat surface that ran the length of the sheet and 3 inches thick on the inclined parts of the vessel. There was no side armor, but the inclined part of the deck, where the engine and boiler were located, was protected by coal bunkers. Steam powered the ship, generated by four doubled-ended, six-furnace boilers located in watertight compartments. It was propelled by two horizontal, triple-expansion, three-cylinder main engines that were able to move the Newark at speeds up to 19 knots. Her coal supply was considerable and gave her a cruising radius of 5,656 knots at a speed of 10 knots an hour. While she was the latest in 1898 design terms, the Newark contained several traditional aspects that pleased older, conservative supporters, such as a poop deck and a top-gallant forecastle. Her engineering was the latest. She carried three masts and was rigged as a bark, with sails that, when fully spread, provided 10,000 square feet of canvas, creating a dual means of locomotion. On March 19, 1890, the Newark was launched at the Cramp Shipyard. The sponsor was Miss Anne Boutelle, daughter of Rep. Charles Boutelle, chairman of the House Committee on Naval Affairs and sponsor of the ship. The festivities took place during a heavy snowstorm, and included Mayor Joseph E. Haynes and about 150 Newarkers, along with members of the Newark Board of Trade (predecessor of the Chamber of Commerce). Attending also were state Sens. Martin, Carter and Werts and Assemblymen Trefz, Pollock and Rabenstein. Before the launch, the Newark public, through the Board of Trade, raised money for the ship’s silver bell. When the ship was decommissioned, the general public asked for the return of the silver, only to discover that none had been purchased. Only a bell, which eventually was returned to the library for display for several years, was returned, much to the embarrassment of the inquirer. On February 2, 1891, the ship was commissioned at the Philadelphia Navy Yard under its first commander, Silas Casey, and first executive officer, Lt. Cmdr. S.W. Very. On March 10, 1892, the Newark was assigned to the North Atlantic Station. In June, it was released to the South Atlantic Station and became the flagship of Real Adm. A.E.K. Benhan. Later that year it was sent to the Mediterranean and took part in the Christopher Columbus celebration at Palos. For the next three years, it saw service in the South Atlantic and served as flagship for three more commanders-in-chief. At the beginning of the Cuban insurrection, prior to the Spanish-American War, it was sent to patrol the St. John’s River in Florida, a favorite site for gun runners. Then it returned to the Norfolk Navy Yard and was temporarily out of duty until the outbreak of the Spanish-American War. On May 23, 1898, the Newark returned to active service. Upon its recommissioning, Newark schoolchildren again contributed their pennies, this time to purchase the ship’s silk standard and chest with a silver plate inscribed, 'Presented by the school children of the City of Newark, N.J., to the USS Newark, June 27, 1898.' Spanish-American War duty included participation in the bombardment of Santiago, Cuba, and the attack on the batteries at Manzanillo, Cuba. Later the Newark was sent to the Philippines and assisted in military operations of Cagayan, Isabella and the Baten Islands. For the remainder of the war, she cruised Philippine waters and then was sent to Yokohama to become the flagship under the command of Capt. Bowman H. McCalla, a New Jersey native. The Newark’s next assignment was in the Boxer Rebellion when Europeans were under attack and a single united force under British commander Vice Adm. Seymour took charge of all allied ships—the first time an American ship was placed in the hands of a foreigner. 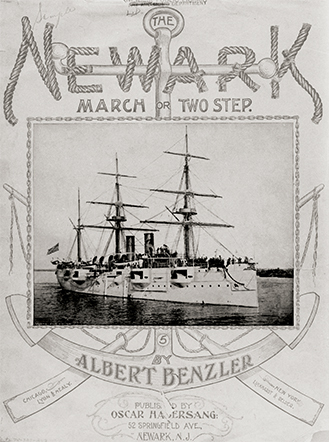 In 1901, the Newark was ordered from Asian waters and returned to New York via the Suez Canal. For approximately a year, it was out of commission in the Boston Navy Yard to be extensively refitted. Her sails, yards and mizzenmast were removed. Overhauled from stem to stern, the price tag was approximately $500,000. In 1902, the ship was recommissioned. For the next year, she cruised the West Indies and South American waters. In 1905 she joined the North Atlantic fleet and was used for midshipmen’s cruisers. In 1907 she was assigned as a training ship for the New York Naval Militia, but never sailed into what later became Port Newark or even the mouth of Newark Bay or the Passaic River. From 1907 to 1912, the Newark was stationed at Guantanamo Bay, Cuba, and then returned to the Norfolk Navy Yard. Finally, the Navy decided to sell her and offered the ship for $50,000. There were no takers. At one point it was suggested that the ship be used for a mechanics’ mate school in Charleston, S.C. In 1914, it was removed from the Navy register and transferred to the Public Health Service as a quarantine ship. Before its transfer to the health service, it was stripped of its guns, engines and other equipment. The Newark arrived at Providence, R.I., on August 29, 1914. While many people would have bemoaned the downgrading of the vessel to a less glamorous status, the local newspapers noted instead that 'she had not been scrapped, sunk, rusted in an obscure place, but was still being used in the service of the country in her old age as a barrier to exotic diseases such as yellow fever, smallpox, typhus fever, leprosy and the plague.' The Newark’s final makeover, beyond removal of her fighting capacities, consisted of covering the deck with a cedar-shingle roof, roof drains for gathering of rainwater for cooking and bathing, installation of disinfectant equipment, addition of two large steam and formaldehyde chambers, and addition of modern boilers to maintain the ship’s new operations. In its reconstituted state, it had accommodations for 300 patients and 40 cabin passengers. With the outbreak of the First World War, the quarantine ship was transferred to the Navy, then returned to the Public Health Service in June 1919. The end of the Newark was reported in a kindly fashion by the Newark Evening News: 'With the Newark, one-time flagship, it isn’t exactly a case of the mighty having fallen. Rather, it is an instance of the mighty engaged in some other useful and important task. At any rate, the Newark is still defending the country.' The end was to come when the old craft headed for the wreckers’ heap in June 1926—towed to anchorage at Providence Harbor at Field’s Point, Narragansett Bay. On January 1, 1943, Navy Secretary Knox notified Newark Mayor Vincent Murphy that 'a recent communication had been received 'advising him that a new cruiser was under construction at the Camden, N.J., shipyards of the New York Ship Building Co. This vessel, too, would be named in honor of the city of Newark, N.J. Small wonder! After all the work by Newark Post No. 10 of the American Legion and the Sgt. James W. Hennessey Post Veterans of Foreign Wars to get the new ship named for their hometown. Murphy wrote back to the Navy secretary: 'I appreciate deeply the honor so bestowed on this city, and I will consider it a great favor if you will advise me when a definite launching date has been set, so that the proper officials may be present.' Unfortunately, that date never came. The war ended, as did the need for the construction of new ships. The Newark was 67.8 percent completed when construction stopped in 1945. Eventually, the uncompleted ship was transported to Newport News, Va., where she was offered to potential purchasers. Like the tiny spools of Clark ONT (Our New Thread) that found their way into the sewing baskets of the world, the bottles of Ballantine beer drunk throughout the nation, and the Krementz collar buttons used by all 19th-century American males, the name of Newark was carried around the world. In war and peace, in emergencies and on state occasions for more than a half-century beginning in 1890, a ship named Newark was found in both the Pacific and Atlantic. Maybe it’s time for another namesake for New Jersey’s largest city, whether a ship or a spacecraft. Perhaps an era of rockets named for American cities would make more sense than constantly dipping into classical mythology for a name. What do you think?